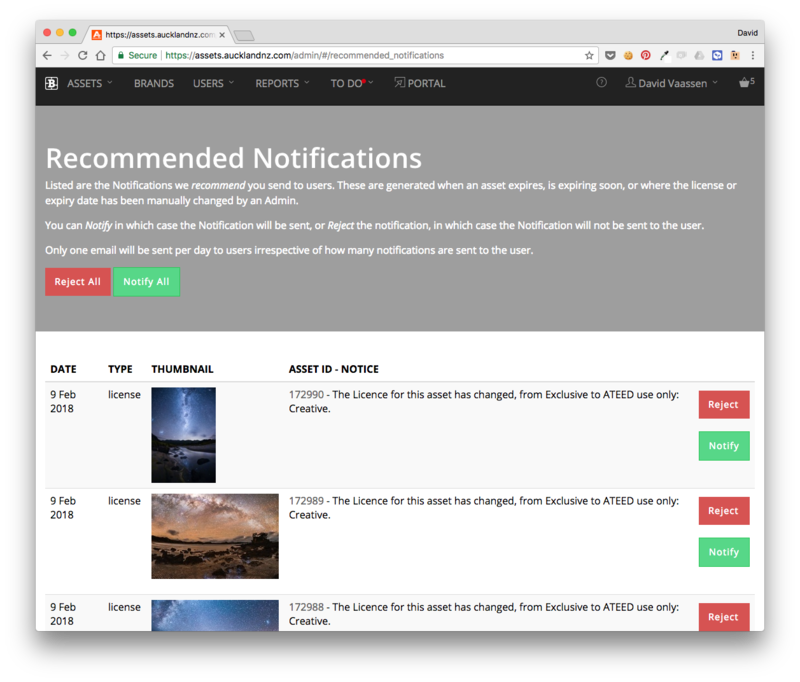 Expired Assets, soon to be Expired Assets and Assets with Licence changes, generate a Asset Alert Notifications. An Asset Alert sends an in-app notification to the any user who has previously downloaded the Asset. - which is shown to Account Admins for approval (before they are sent). In some cases Admins may elected to NOT send these. If a Recommended Notification is Approved and sent, then the notification icon will appear in the users account Navigation bar (top of screen) provided they are logged in. In addition a user will receive an email indicating there are outstanding notifications to review (sent each day there are outstanding notifications). Users should click either the Notification icon (navbar) or the link in the email to view the user's Notifications page. On this page the user should review the Notification and click the Acknowledge button to clear the notification. When a user Acknowledges a Notification we will record the date and time of your Acknowledgement and clear it. You should ensure you have updated your records before you click Acknowledge. We'll continue to send you daily reminder emails about Notifications until they are all Acknowledged.